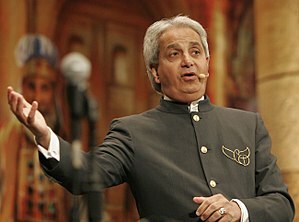 Benny Hinn is known by being on TV and his crusades around the world. Is Benny Hinn a true teacher? Is Benny Hinn a false teacher? Is Benny Hinn a false prophet? Is he a true prophet? The following will be actual statements and quotes from Benny Hinn’s teachings on what he believes concerning certain topics and you examine for yourselves whether Benny Hinn is of God or not. Benny Hinn teaches that Jesus would have sinned if it had not been for the Holy Spirit (Holy Ghost). This is a false teaching from Benny Hinn, because John the Baptist was filled with the Holy Spirit from birth, and yet John the Baptist was not without sin. Jesus was anointed with the Holy Spirit (Holy Ghost) at the age of 30, what about the 30 years before that? Jesus was without sin before the Holy Spirit (Holy Ghost) came upon Him, and to teach that Jesus would have sinned without the Holy Spirit (Holy Ghost) is to say Jesus was not truly God in the flesh. Jesus was true God and true man. Jesus would have not sinned if the Holy Spirit had not been there, and Benny Hinn is a false teacher to say that Jesus would have sinned. Benny Hinn quotes on Jesus becoming the nature of Satan: “He [Jesus] who is righteous by choice said, ‘The only way I can stop sin is by Me becoming it. I can’t just stop it by letting it touch Me; I and it must become one.’ Hear this! He who is the nature of God became the nature of Satan where He became sin!” (Benny Hinn, TBN, December 1, 1990)…”Ladies and gentlemen, the serpent is a symbol of Satan. Jesus Christ knew the only way he would stop Satan was by becoming one in nature with him. You say, What did you say? What blasphemy is this? No, you hear this! He did not take my sin; He became my sin. Sin is the nature of hell. Sin is what made Satan. It was sin that made Satan. Jesus said, “I’ll be sin! I’ll go to the lowest place! I’ll go to the origin of it! I won’t just take part in it, I’ll be the totality of it!” When Jesus became sin, sir, He took it from A to Z and said, “No more!” Think about this: He became flesh, that flesh might become like Him. He became death, so dying man can live. He became sin, so sinners can be righteous in Him. He became one with the nature of Satan, so all those who had the nature of Satan can partake of the nature of God.” (Benny Hinn TBN December 15, 1990). These are false teachings of Benny Hinn concerning Jesus on the cross and Jesus becoming the nature of Satan., becoming spiritually dead. (spiritual death) Jesus was our sin sacrifice, Jesus did not become literal sin or die spiritually, that would make Jesus a sinner, and that would make Jesus a blemished lamb unworthy to give His life for a sacrifice for sins (John 1:29 & 1 Peter 1:18-19). Christians are not without sin here on earth, Christians still sin even after being born again, but when Christians are transformed into the spiritual body then they will be without sin (1 Corinthians 15:40-52 & Romans 7:14-25). To teach Jesus became literally sin, that Jesus took on the nature of Satan is heresy, and shows Benny Hinn is a false teacher. That makes the Holy One of God a sinner, blemished, and that Jesus would have then needed a Savior Himself. These are false teachings from Benny Hinn according to what the Bible teaches. These quotes from Benny Hinn prove clearly that Benny Hinn is not a true teacher of God, but that he is false teacher. For Benny Hinn to be a true teacher he would have to have his teachings line up with what the Bible teaches, but Benny Hinn is not a true teacher of God because what he teaches is not what the Bible teaches. There will be some who will say we hate Benny Hinn and some will email us saying do not touch God’s anointed, and some will say that God is going to judge us. We do not hate Benny Hinn, and we have not touched Benny Hinn, because when the Bible says do not touch God’s anointed that means do not kill him, and it does not mean that we cannot examine what someone teaches. It is true that we will be judged, because all mankind will be judged for what they have done. We believe many have been misled by what Benny Hinn teaches and that is why we have put this information here. If you believe we are wrong about what we have shared you are welcome to let us know where we are wrong from the Bible. One who is a true prophet of God teaches things that line up with what God has given, and Benny Hinn’s teachings prove that he is not a true prophet of God but that he is a false prophet.